Hallelujah! The Harper nightmare is over for Canada — and for me as well. I am no longer “the blacklisted artist” — and may actually be welcome on the Hill! Liberal Leader, Justin Trudeau, surfed “a wave of revulsion at Harper’s spiteful governing style.” He swept into power on October 19, 2015, decisively ending Harper’s nine-year reign. Battling the oppressive Harper government will forever be on my resume — and something I can be proud of. Ironically, I have their heavy-handed censorship of my art to thank for lighting a fire under me and inspiring me to speak up and fight for my rights. By censoring my art they inflamed my passion and the passion of many people around the world who care about freedom of expression, democracy, civil rights and the environment. 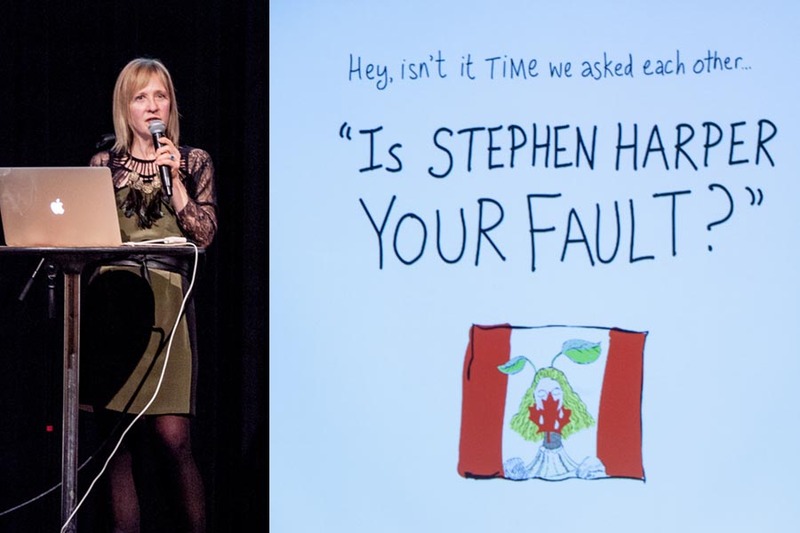 Harper’s gang unwittingly set in motion an incredible series of events from 2011 to 2015 which culminated in My Dangerous Art: Free Expression in a Climate of Fear — just twenty-five days before the election. 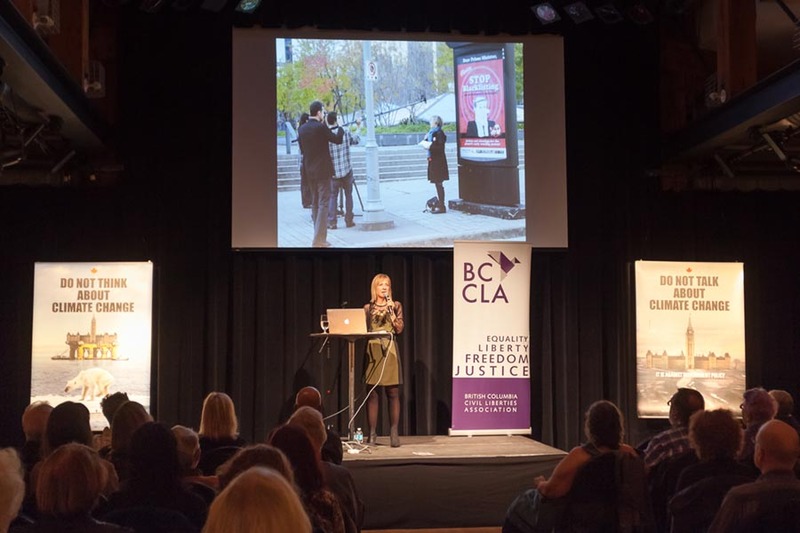 The event attracted an audience of BC Civil Liberties Association members and civil rights supporters who turned out to hear my true-life story of being censored — and see the protest artwork I created to fight back. 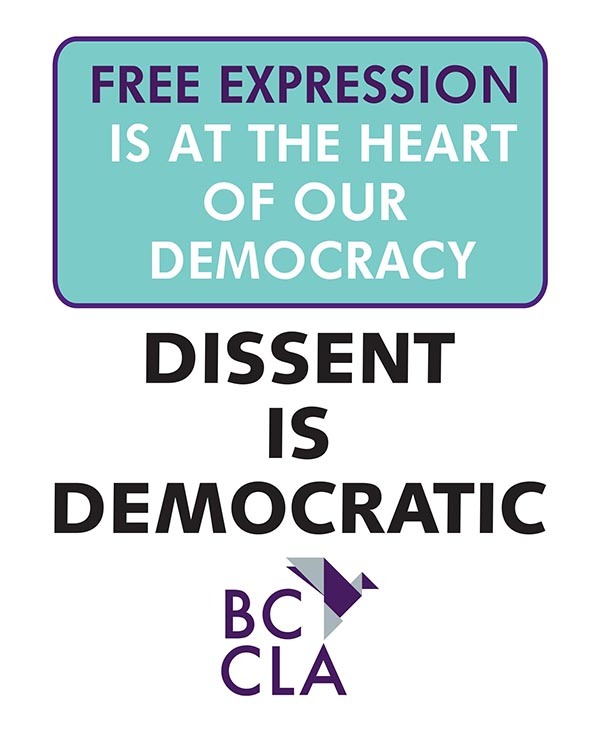 “We believe it is a critical time for free expression in this country. In just the last two years, cities have passed laws curtailing the right to demonstrate, scientists in employ of the government have had their voices muzzled, and ‘anti-terrorism’ laws are being used to limit our rights to free speech. 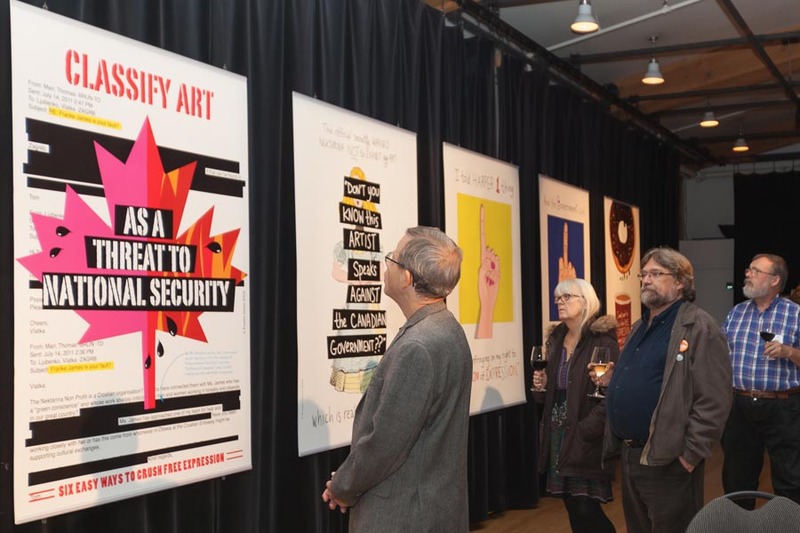 My Dangerous Art exhibition would never have happened if the Harper Government had not tried to shut me up — and I had not fought back. 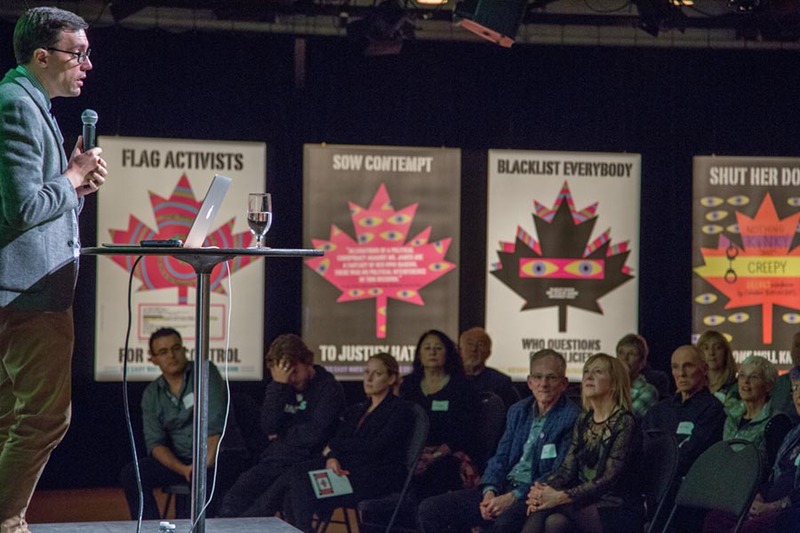 On September 24th, over one hundred and forty people turned out to see my “dangerous art” in Vancouver — and to hear how Canadian officials who censored my art tried to hide that they had done so. Performance Works theatrical space glowed with 33 artworks, including the “Dear Prime Minister” series first posted on transit shelters in Ottawa in 2011, and the “Do Not Talk about Climate Change” poster which travelled to Ottawa, Calgary, Halifax and “Oh No Canada!” in Washington, DC, plus a number of new never-before-seen works. 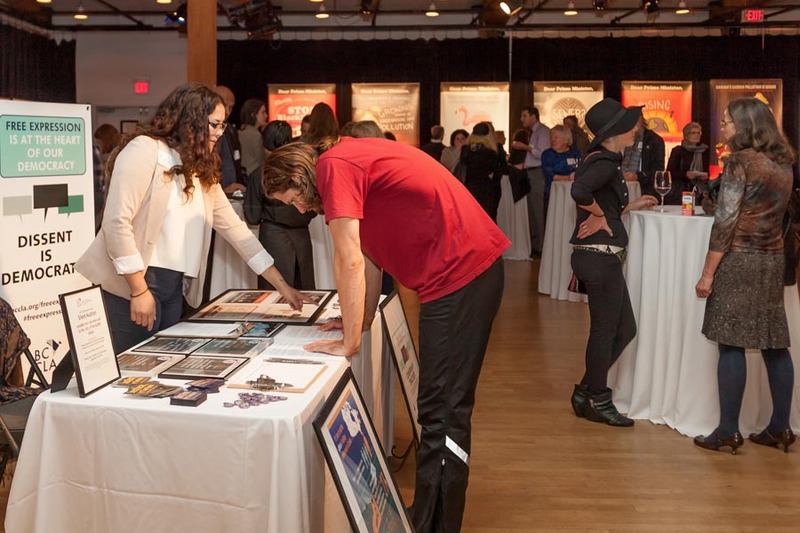 The show represented eight years of my work — from 2007 to 2015. 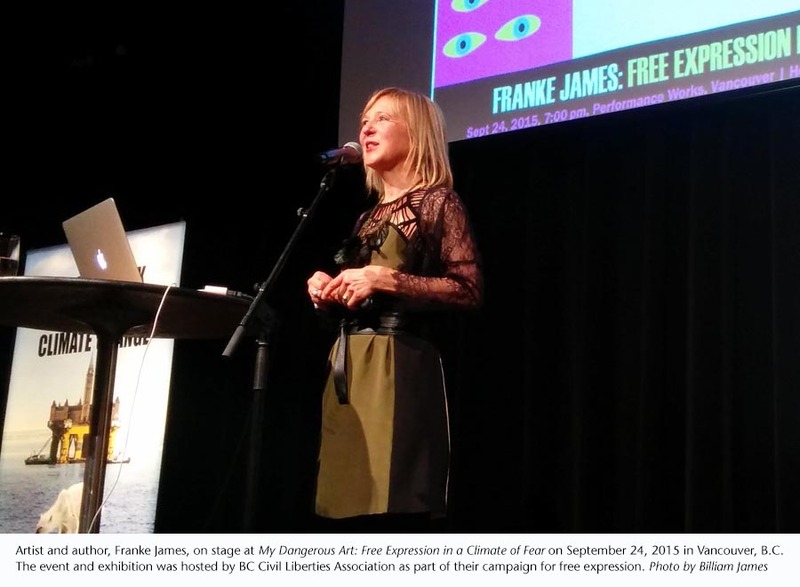 Repression-proof artist, Franke James, celebrated by BCCLA. 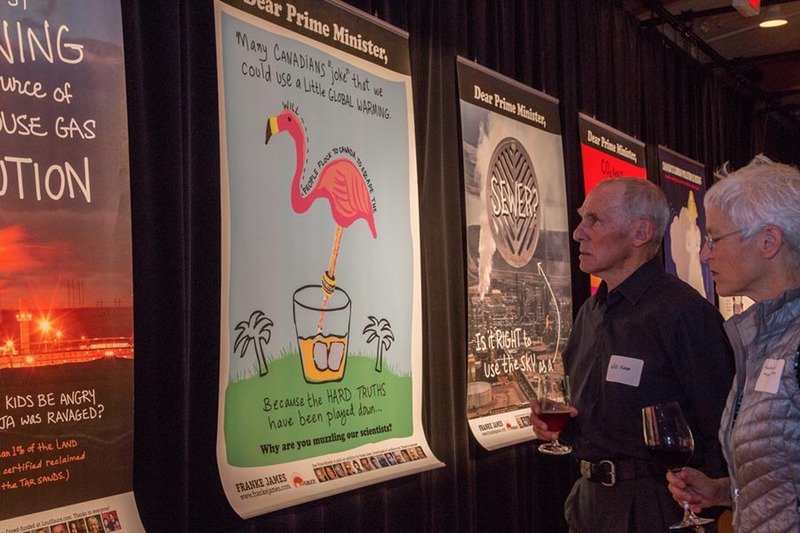 My new series, Six Easy Ways to Crush Free Expression, was debuted that evening. It features the iconic Canadian maple leaf — so there is no question this is about Canada. 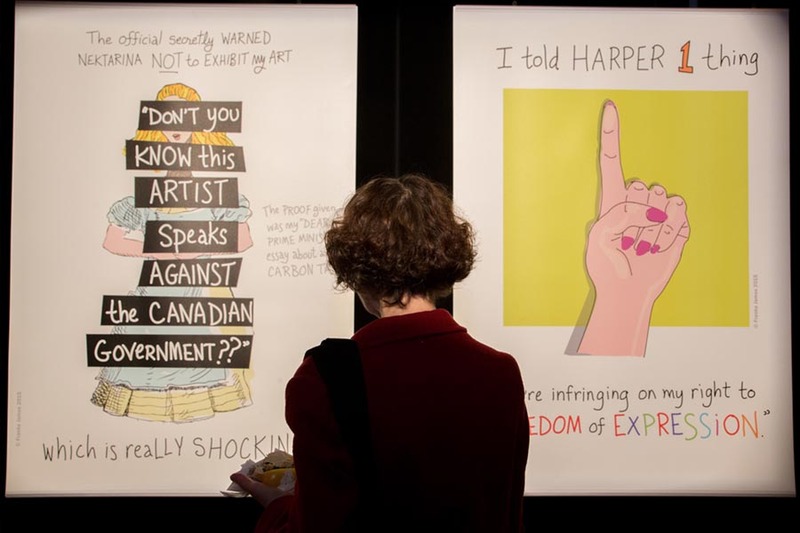 The Six Easy Ways artwork is based on my experience of being blacklisted, monitored and censored by the Harper Government. 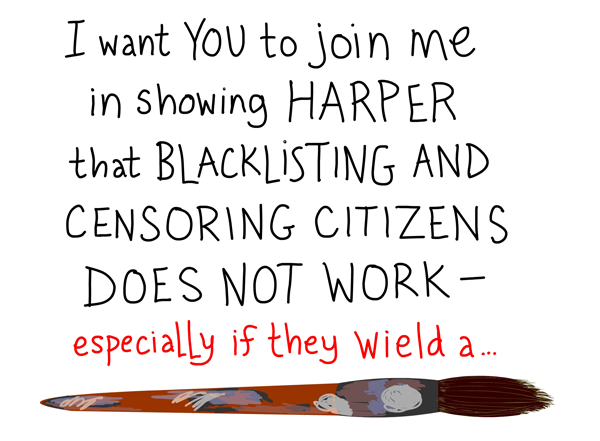 The six tactics the Harper government used to crush citizen’s rights were: 1) Redact the Truth — To Conceal Censorship, 2) Flag Activists — For Spin Control, 3) Classify Art– as a Threat to National Security, 4) Sow Contempt — To Justify Hatred, 5) Shut Her Down — No One Will Know, 6) Blacklist Everybody — Who Questions Government Policies. 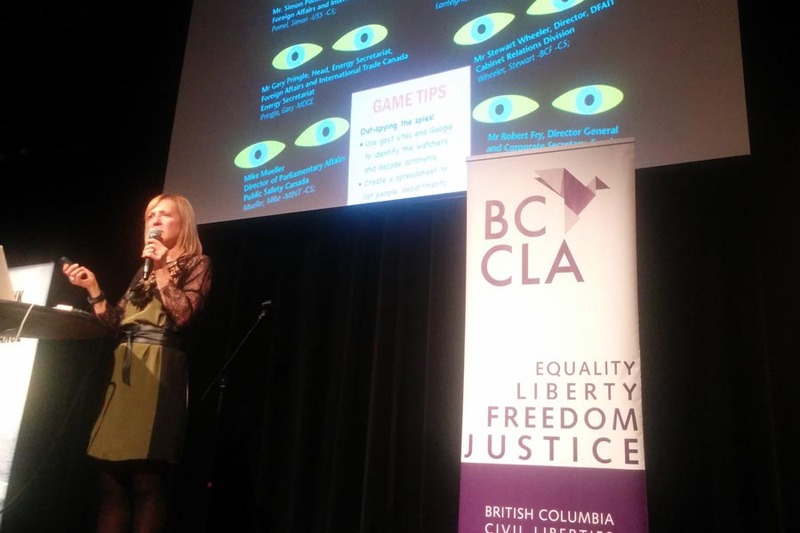 I talked about being Banned on the Hill, government surveillance and the nasty games Bureaucats Play. Clearly lots of Canadians asked themselves the same question. Twenty-five days later Stephen Harper was turfed out, bringing an end to the Harper government forever. 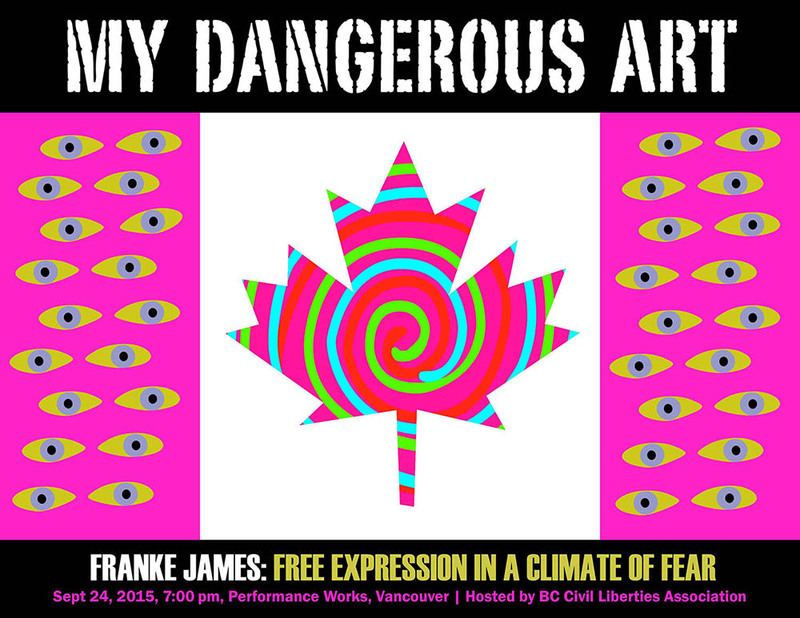 My enthusiastic thanks to BC Civil Liberties Association for hosting My Dangerous Art: Free Expression in a Climate of Fear. 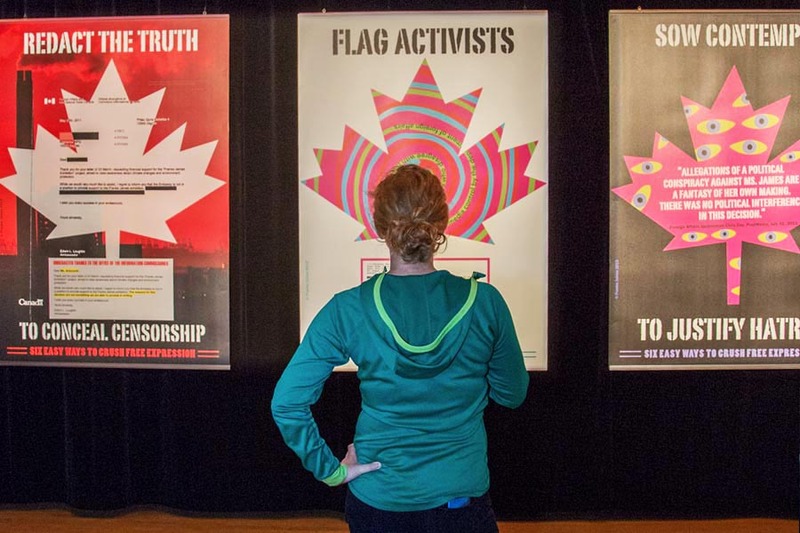 The six posters from my protest exhibition “Banned on the Hill” in Ottawa in 2011 were on display at My Dangerous Art event. I hope that Justin Trudeau can do a better job than his predecessors at defending Canadian’s right to free expression. Four years ago when I contacted the three opposition parties seeking their non-partisan help, the ONLY political party to speak up on my behalf was the Green Party of Canada. 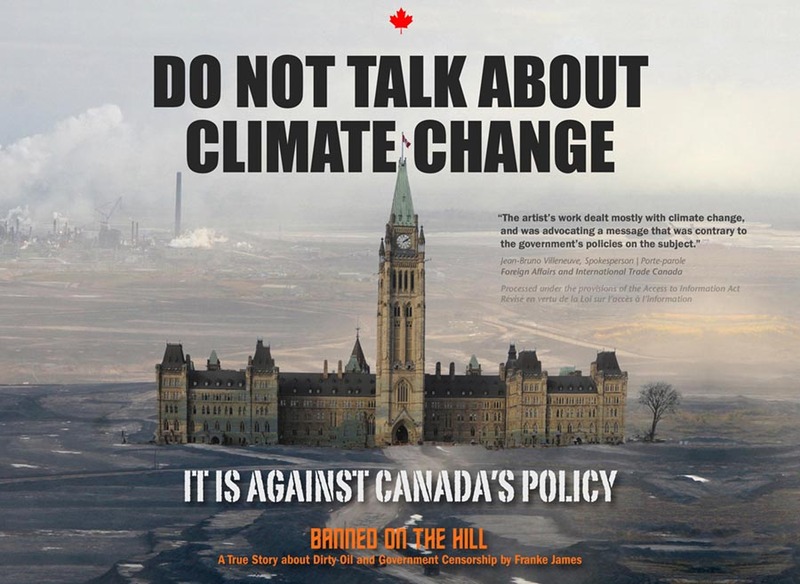 The Banned on the Hill show in 2011 received lots of media coverage — including an interview on CBC’s The Current — The intersection of Government, Art and Politics — which helped to raise awareness of the Harper government’s tactics to silence environmental voices, but it was not enough. Many people remained oblivious to the many ways that freedom of expression was being trampled. Over the course of the next two years, I wrote Banned on the Hill: A True Story about Dirty Oil and Government Censorship. 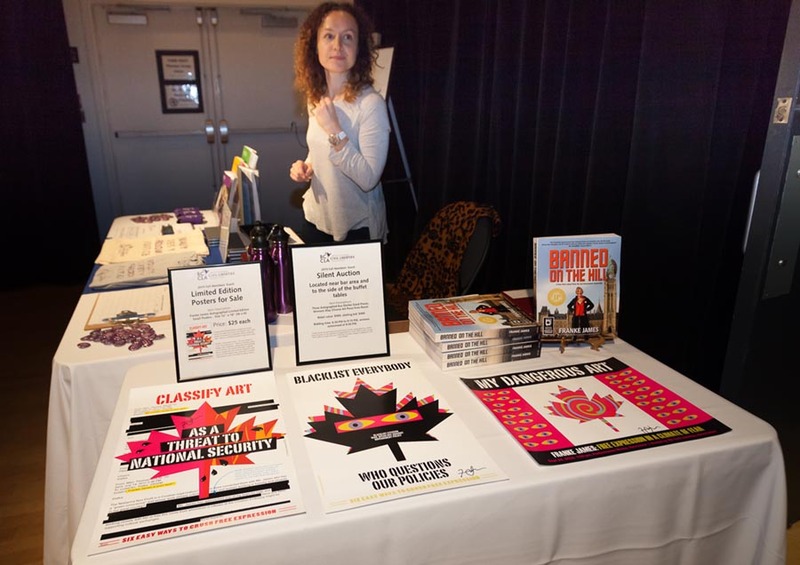 Within a week of the book’s release Suzanne Goldenberg at the Guardian UK newspaper wrote about it, “Artist finds inspiration in Canadian government’s attempt to silence her”. 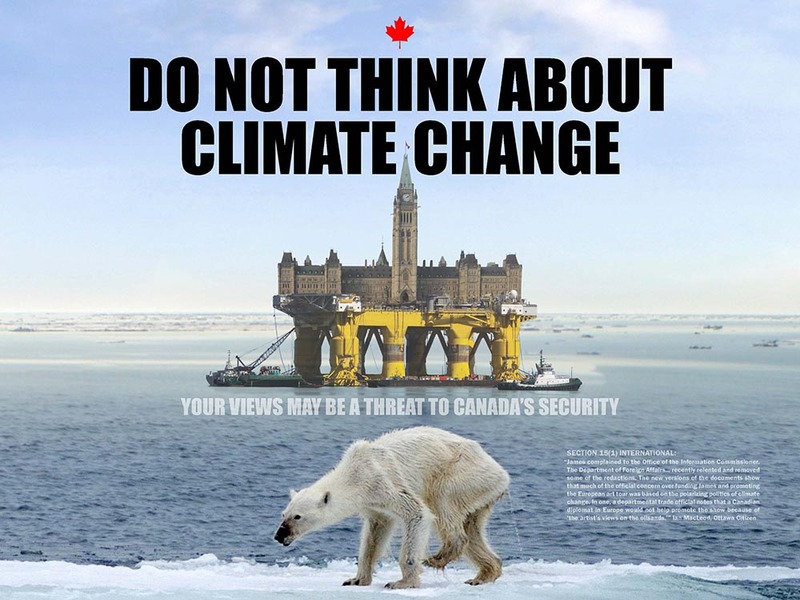 Do Not Talk about Climate Change shows the Parliament buildings dropped into the oilsands and features a quote from an internal government email discussing my art. 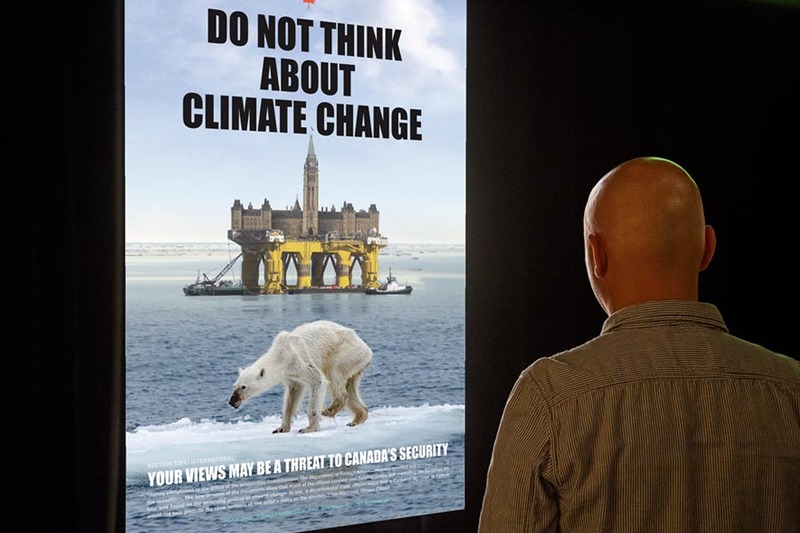 Two hundred and twenty-one people joined in the crowdfunding campaign enabling the posters to go up in Ottawa, Halifax, and Calgary — at the same time as the Conservatives were holding a convention — in 2013. The Oh No Canada! 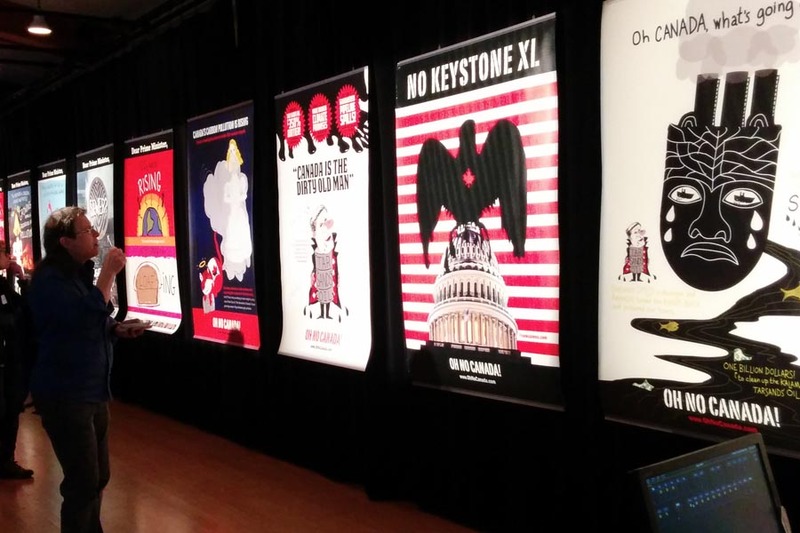 posters that were shown on bus shelters in Washington, DC in 2013 were exhibited at My Dangerous Art. 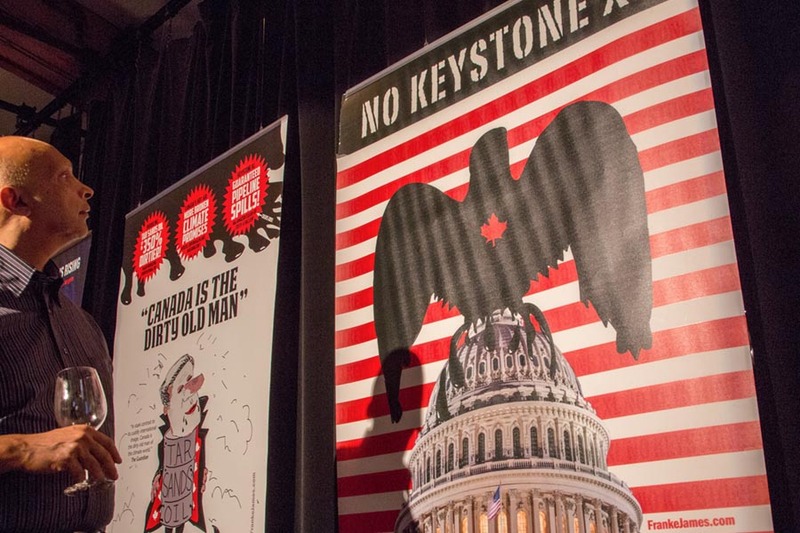 The posters were also featured in a story, What can “Anybody” tell Obama about the Keystone XL? which was printed, bound and presented with 1,200 signatures to the Whitehouse. 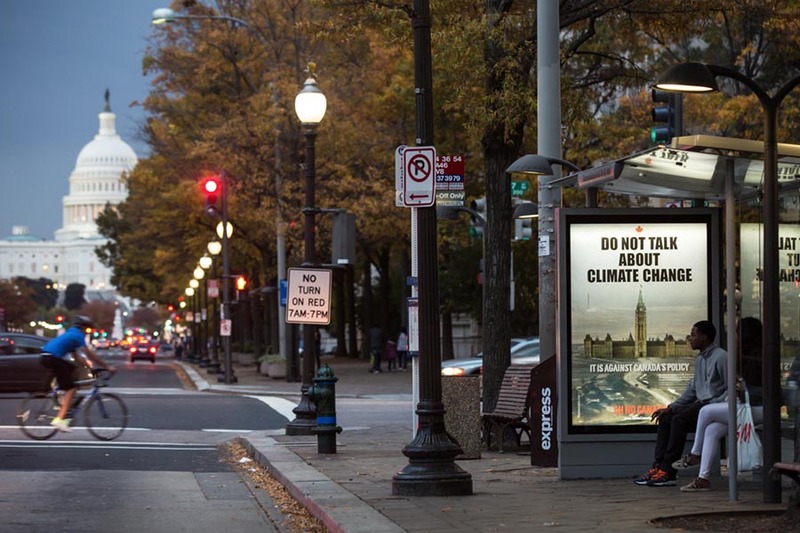 The photo below of my “Do Not Talk about Climate Change” in Washington, DC in 2013, will be featured in an upcoming book on Canadian politics. James is part of a Canadian delegation that will be in Washington, DC next week for high-level meetings and to share the Canadian perspective of the Harper government, tar sands, and climate change. Under the government of Stephen Harper, Canada has been cracking down on dissenting voices, including scientists, activists, and artists. 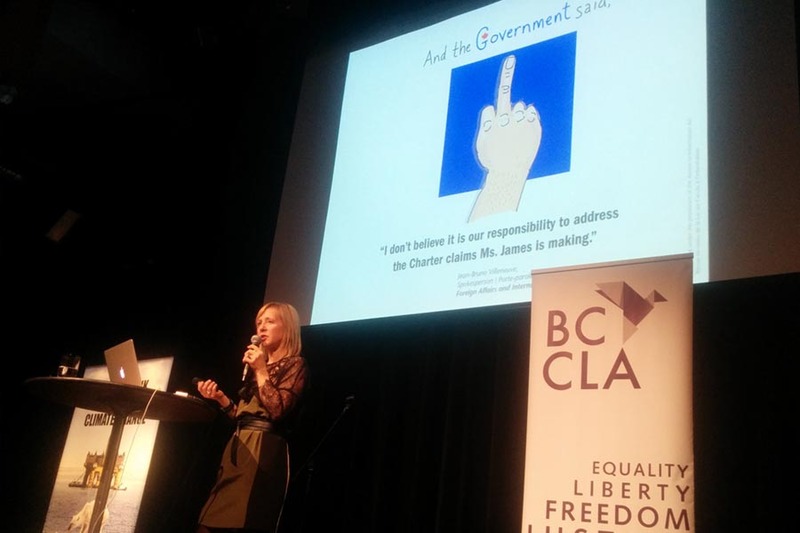 Documents show that James fell victim to this aggressive censorship when her 20-city European art show was cancelled as a direct result of behind-the-scenes government interference by high-level bureaucrats, including the Deputy Director of Climate Change, Jeremy Wallace, a Canadian Ambassador Scott Heatherington and a Senior Trade Commissioner in Berlin Thomas Marr. Franke James, is the author of Banned on the Hill and the winner of the PEN Canada / Ken Filkow Prize and the BCCLA 2014 Liberty Award for Excellence in the Arts. 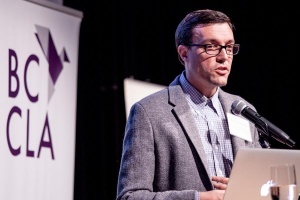 Franke’s experience fighting government censorship is being used to teach grade school students about government censorship. She is contributing a chapter to a new anthology entitled “Access to Information and Social Justice” by Kevin Walby, University of Winnipeg and Jamie Brownlee from Carleton University. “This is so fun,” said James repeatedly. 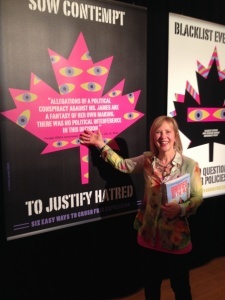 Standing in front of a bright pink maple leaf with a swirl of words inside, one of her six new posters about government repression. “Flag activists for spin control,” she said, reading the words on the poster. When foreign affairs said there was no political interference in this decision to cancel the show, they were spinning a story. Do you think a government has the right to censor an artist’s work if it makes the government look bad? 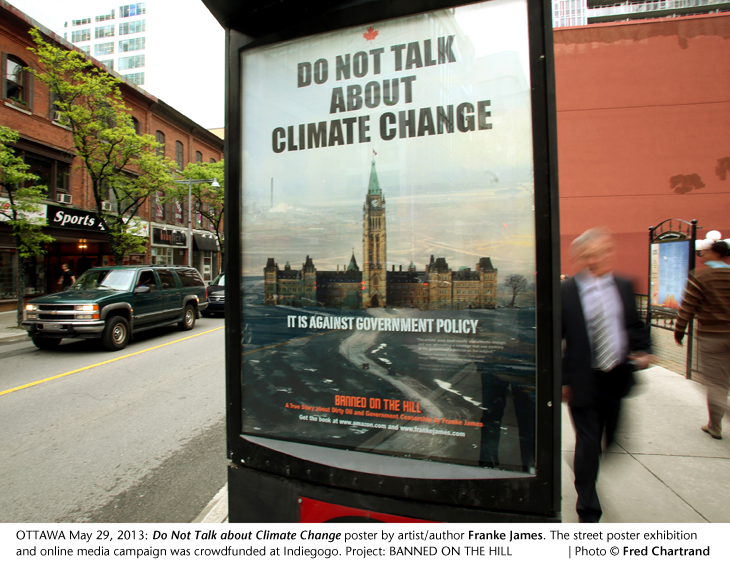 2013 Media Campaign: Crowdfunding Puts Do Not Talk Posters Up in Ottawa, Calgary and Halifax. 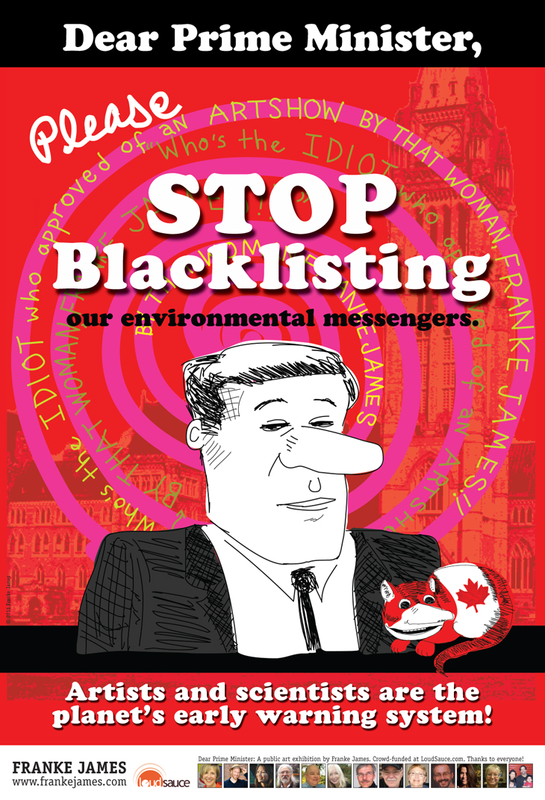 Book 2013: Banned on the Hill: a true story about dirty oil and government censorship. Nice to see you helped get rid of Harpy. Hope we never have to do something like this again, but keep both eyes open and focused on Ottawa, the big banks and BIG OIL. Well done! A fantastic crusade to help topple a dangerous would-have-been dictator before it was too late. Thank you very much.